UK Education Guide helps prospective students and family members easily access key information about universities to help frame their college decision making process. In a marketplace crowded with sites that feature lots of information about universities but little way of comparing information, Kiosk has developed the site to allow easy comparison of key facts across institutions. “The site is mainly aimed at international students and their families who may be exploring international study options for the first time, so we felt it was important to make the information provided as meaningful and easy to compare as possible”, says Amy Laun, web designer and developer at Kiosk. “We have focused on producing summary university profiles, that then expand to provide much more detailed information, if required. The information we highlight in the summary profiles is directly comparable between universities”, she adds. The detailed university profiles also highlight key information specifically relevant to international students and their families including; international student fees, distance of universities from international airports, safety and location issues including the distance of halls of residence from college campuses etc. The needs of international students and parents are often quite different from students studying in their home country, not least because often they will not have visited the university before applying. 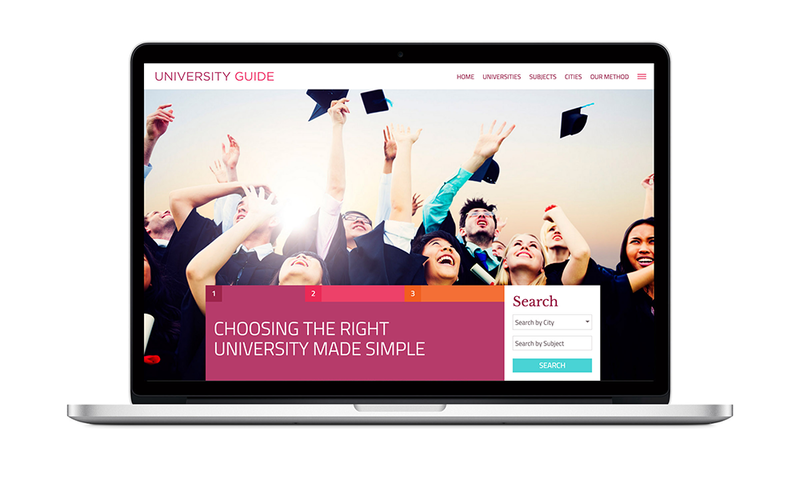 The founders of University.Guide noticed that sometimes key information, particularly relevant to this market, is not easy to access on university web sites and this is something they are keen to provide. The site has launched with the top 50 ranked UK universities and plans to extend to other UK institutions before starting to feature US colleges.